Today I'm drinking Rastafa Rye Ale brewed by Blue Point Brewing Company in Patchogue, Long Island, New York. This is perhaps the busiest label I have ever seen, and thank God they bottle it in 22 ounce bottles for space reasons alone. 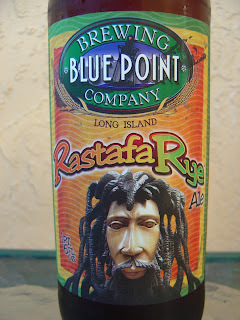 Let's start with the dude with dreads on the front of the label. Looks like a kids toy, but I do see somewhere else on the bottle that this might be a hand-carved mahogony piece of art. Not sure. The colors are predominantly the reds, yellows and greens you might associate with Jamaica. 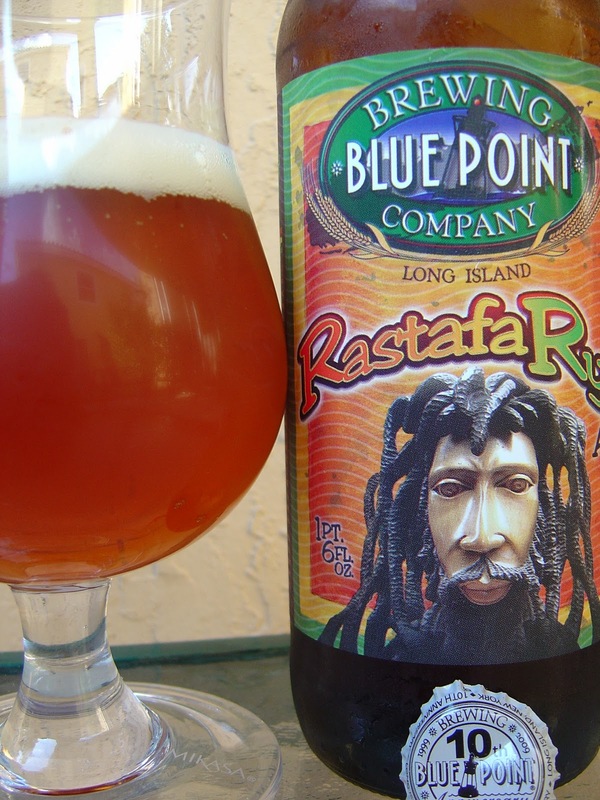 The bottle cap mentions Blue Point's 10th Anniversary in 2009. Working around the bottle, you'll find the brewery's Freshness Seal which says "Craft Brewed Xtremely Fresh". They further go out of their way to let you know that they are independently owned and operated with NO CORPORATE TIES. 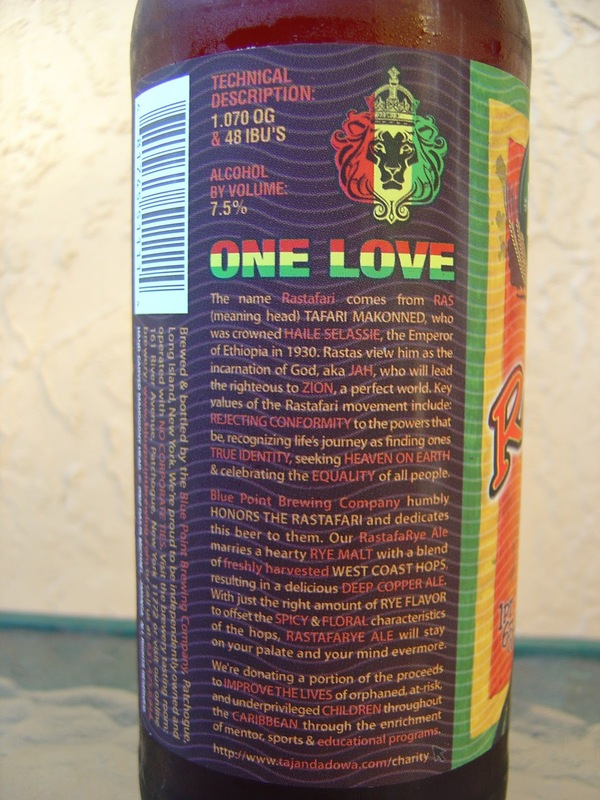 I'm hoping you will be able to read the Rastafari story on the back, but it's printed in a microscopic font size, so we'll see (actually the picture is very clear, see below). To sum it up, this one Honors the Rastafari and gives a quick history lesson. If you read to the end, this is a charitable beer, with a portion of the proceeds benefiting underprivileged children in the Caribbean. The charity website listed on the bottle redirects to Taj Weekes' website, but the page is not found. I've emailed Taj to see if I can find out anything else, and I also just left a voice mail at the brewery since their website just says "New site coming soon!" Actually, before I could publish this, the brewery responded to my inquiry on Twitter saying the new site would be up this month and that they'd look into the charity page move. Update 11/13/2010: Sarah, the Director of Marketing and Public Relations for Taj and the the They Often Cry Outreach charity responded to me today. She made sure the link that the bottle lists redirects to the correct charity site. You should check it out! Big rye aroma, lots of malt and bread and quite spicy. The rye flavors also dominate in the beginning. Malty, spicy black pepper, and rye bread. Dare I say there is an herbal component here? Well, I am saying it! Floral. Some orange citrus sneaks in as you drink a little bit as well. There is an underlying sweetness, but the beer isn't sweet. Prickly and aggressive carbonation, which is nice and works well with the spicy aspect and drying from the 7.5% alcohol. There are 48 IBUs here too. I've really been digging rye beers lately and this one was a flavorful nice beer. And at $4 for the 22 ouncer, this is a beer I'd definitely drink again. 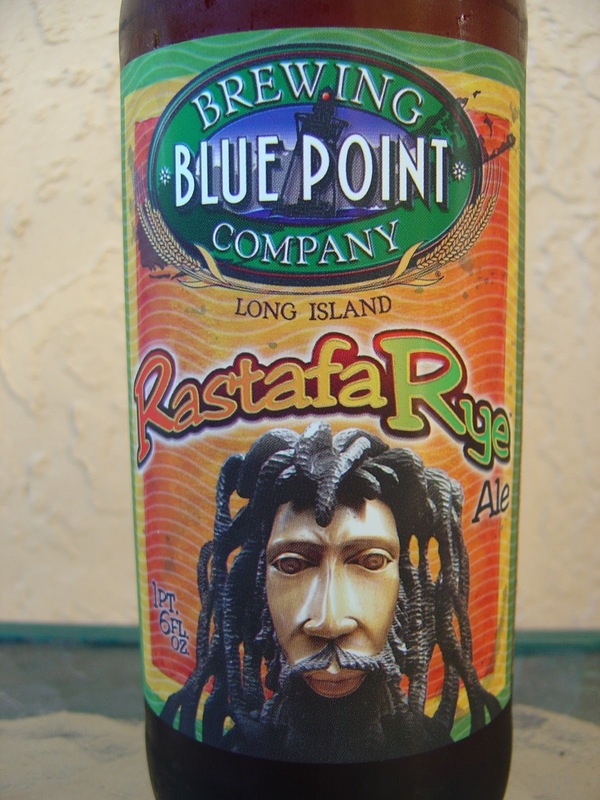 Nice job, Blue Point! I'm a huge fan of rye in beer so will keep my eyes peled in TW for this one. I'll have to put one of my Rye Harvest Ales aside for you to try. It came out pretty nicely I think. Yeah, this one I got at Total Wine, so you should see it soon. Love the rye. I haven't seen you in a while, so how many home brews have I missed. Better question, are you saving me any? You've missed 4 of mine and I think just one of Brent's...yes I'm prolific ;) I have another 2 fermenting as we speak. And of course I'm saving you some!